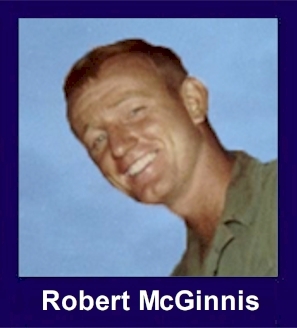 The 35th Infantry Regiment Association salutes our fallen brother, SGT Robert Ray McGinnis, who died in the service of his country on July 2nd, 1969 in Pleiku Province, Vietnam. The cause of death was listed as Mortars. At the time of his death Robert was 20 years of age. He was from Jonesboro, Arkansas. Robert is honored on the Vietnam Veterans Memorial at Panel 21W, Line 47. The decorations earned by SGT Robert Ray McGinnis include: the Combat Infantryman Badge, the Bronze Star, the Purple Heart, the Air Medal, the National Defense Service Medal, the Vietnam Service Medal, the Vietnam Campaign Medal and the Vietnam Cross of Gallantry with Palm Unit Citation. I remember the day I met Robert (Red) McGinnis. We were at the 3rd Brigade Basecamp at The Oasis, near Pleiku. My squad was down to six men so I had first choice of replacements. As I looked down the line I saw Red, his face beaming with a smile from ear to ear. I asked Red where he was from. He told me Jonesboro, Arkansas. I asked him if he hunted. He told me that not only does he hunt, but he always gets a deer. Red was my first choice. Red walked point most of the time. He was a true professional although he was just out of his teens. Red probably saved us more than once by his ability to read signs in the brush. In July 1969, about two weeks after I returned home, Dennis Bryerton wrote to me and told me that Red had been killed in action. I cannot begin explain my feelings at hearing the news. Red was a credit to the United States Army while serving with B Company, 1st Batallion, 35th Infantry. I never saw him when he was not smiling. For distinguishing himself by outstanding meritorious service in connection with ground operations against a hostile force in the Republic of Vietnam. Through his untiring efforts and professional ability, Specialist Four McGinnis consistently obtained outstanding results. He was quick to grasp the implications of new problems with which he faced as a result of the ever-changing situations inherent in a counterinsurgency operation and to find ways and means to solve those problems. The energetic application of his extensive knowledge has materially contributed to the efforts of the United States mission to the Republic of Vietnam to assist that country in ridding itself of the communist threat to its freedom. Specialist Four McGinnis initiative, zeal, sound judgment, and devotion to duty have been in the highest traditions of the military service and reflect great credit upon himself, his unit, and the United States Army.